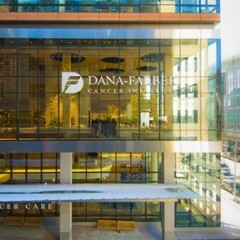 Exterior shot of the Dana-Farber Cancer Institute, one of the seven institutional members that comprise the Dana-Farber/Harvard Cancer Center (DF/HCC) consortium in Boston, Massachusetts. Founded in 1997, DF/HCC integrates and builds on the collective talent and resources of five principal Harvard-affiliated hospitals and two Harvard health science schools. It is the successor organization to the Dana-Farber Cancer Institute Comprehensive Cancer Center, which was first designated as an NCI cancer center in 1973.